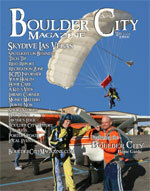 by Dennis McBride, Boulder City Museum & Historical Assn. The second largest contractor on the Hoover Dam Project was the Babcock & Wilcox Company (B&W) which fabricated the dam’s steel penstock pipes. When the company set up its plant and offices near the dam site in 1933, it built homes in Boulder City for its employees and executives. Where these houses were built and what became of them over the last 73 years is an interesting exercise in urban genealogy. In 1933 contractor Fred Snell built a two-story dormitory on Block 28 at what is now the southeast corner of Avenue A and New Mexico Street. When B&W’s work was finished, the company sold most of its Boulder City properties to the Los Angeles Department of Water and Power [LADWP]. LADWP sold the dormitory in 1940, and shortly after World War II it was demolished to make way for homes being built in the area by N. P. Van Vaulkenburgh. Snell also built the seven apartment buildings on the west side of Avenue B in 1933, which still stand, although most have been remodeled until they bare little more than a structural resemblance to the original buildings with their screened-in sleeping porches and sunny entries. 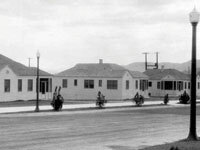 In 1934, Boulder City contractor Paul Webbwho built the Boulder Dam Hotelbuilt the three apartment buildings along the south side of Avenue A which still stand in close to their original appearance. It was B&W which first developed Hillside Drive on the northeast side of town next to the Bureau of Reclamation administration building. In 1933 the company built two elegant homes at #2 and #3 Hillside for project supervisors Basil Kehoe and R. S. Campbell. Like the Six Company executive homes on the hilltops west of town, the B&W mansions commanded sweeping views of Eldorado Valley and the future Lake Mead. #2 Hillside was demolished in the late 1980s and replaced with a home out of scale with its neighbors. But #3 Hillside is now being restored to its original elegance by owners John and Mary Shope Wiles. But the most charming collection of B&W homes was on Block 14, where Boulder City’s post office now stands. Between January and March 1933 B&W built 12 frame cottages with separate garages for its mid-level managers. B&W employees in 1935 stood here in their front yards to watch Franklin and Eleanor Roosevelt pass through town on their way to dedicate Hoover Dam, and by 1986 the B&W block with its huge elms and mulberries provided a green and shady entrance to Boulder City for tourists coming up from Lake Mead. But when the Boulder City post office needed a new home, this was the block it chose. On May 9, 1987 all the cottages were auctioned and moved. One cottage went to the Clark County Museum where it stands today restored on Heritage Street. Four houses were moved to St. Jude’s Ranch for Children; two homes, set end-to-end, became 515 Cherry Street, while another pair became 202 Donner Way and 203 Mead Way in Lakeview. Loss of the B&W block was a serious and controversial blow to the city’s newly-designated Historic District. Sponsored by the Boulder City/Hoover Dam Museum.